Play your Amiga games in all HD glory with the 720p output from the Armiga. 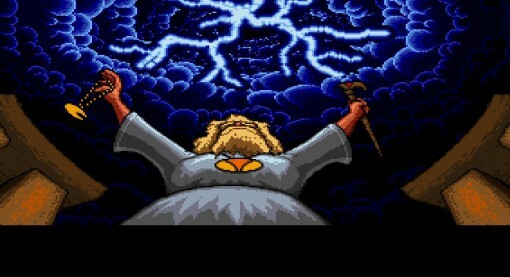 Play them fullscreen (16:9) at original 4:3 or a something in between (3:2) and enhance them with scanlines, a CRT effect or plain pixel doubler. Our exclusive floppy disk controller lets you read your own Amiga disks and transform them in an ADF file, as long as they are not copy protected. Just insert your disk and get a digital copy! Bring in your games in the supplied 8GB Class10 microSD card or in a pendrive. Just plug it into any USB port and get instant access to them. Also use your PC-standard USB mouse, keyboard and gamepad. New features, improved compatibility and bug fixes are delivered for FREE to all our customers by email. Just drag and drop the update and your Armiga will update automatically. The machine, which we call the Armiga, is a beautiful piece of modern technology. 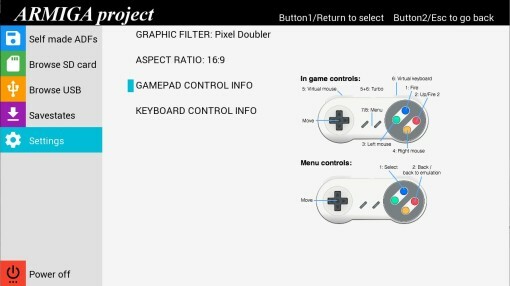 It’s built around a modern Dual Core ARM CPU, that plays together with our custom made floppy controller. This is the key of the machine: We’ve developed our own controller, able of reading Amiga disks, decode them and make them available for executing. Sounds simple, right?. 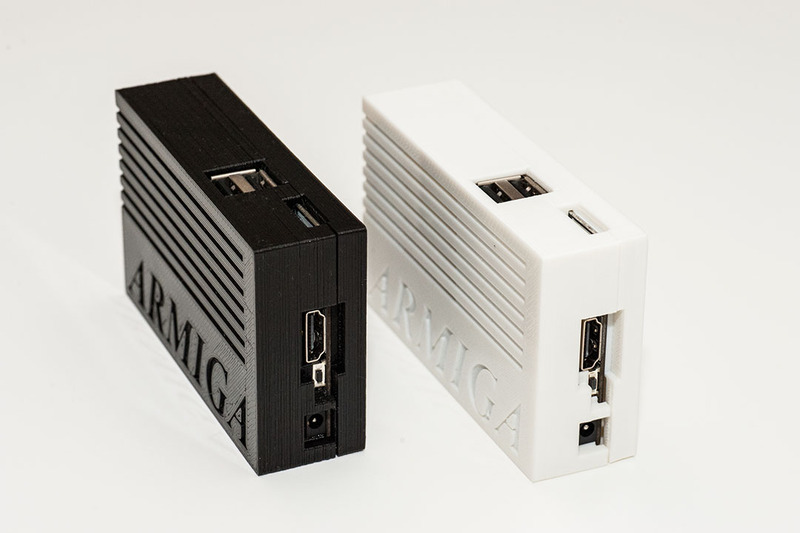 The Armiga aims to emulate both the Amiga 500 with 1MB of RAM and Amiga 1200 with 2MB of RAM as close as possible to the original ones. 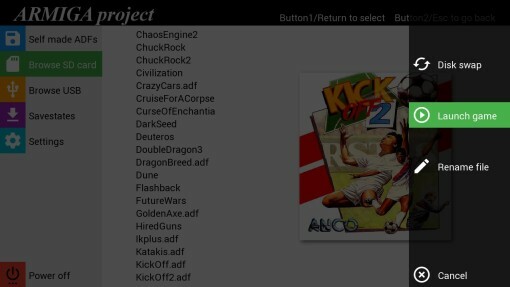 And for you not to get your hands dirty, fully legal copies of Kickstart 1.3 and 3.1 are provided with every Armiga! The Armiga does everything right, has a very simple user interface, upscaling to HD, it is limited to what is essential and that is very good. I find that it is very well thought device. Just plug in and have fun. The Armiga is Super! Thanks for that. I bought the disk drive version – primary to dump all my old Amiga backups to SD card (which worked flawlessly). I’ve played some games via existing adf images and I’m really impressed with the emulation and how good they look on a HDTV. 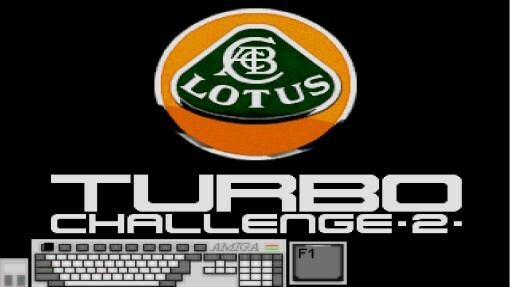 I’ve used Amiga emulators for many years on home computers and they’re generally horrible to use. Armiga is like a breath of fresh air in comparison. Got one they’re really cool. Simply bought it to archive all my Amiga floppy disks straight to micro sd card!! And play them and preserve my 3.5″ disks for a rainy day. I love it. I like pure simplicity that delivers exactly what is needed for nostalgic-fun time I have now. Emergency mouse and keyboards (on screen) on joypad is great idea! I use old logitech and works fine on analog mode. Thanks for a great entertainment time capsule! I ordered one. First impression was that real good piece of hardware. I connected mouse,keyboard,usb hub and joystick and played games from usb memory stick. Simple and elegant, with usability as main focus. It allows the load of games from self ADF images made from floppies, ADF images from SD Card and USB. 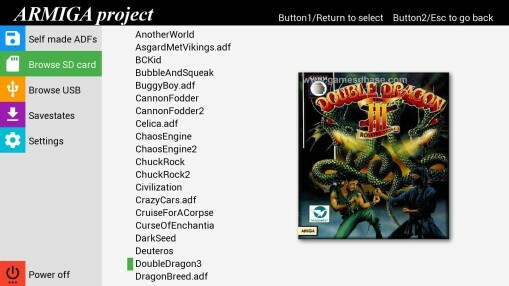 With Armiga you can easily browse and manage your collection of games and add covers to them. You will need only a computer with a SD card reader. It´s as easy as drag and drop. You can also use a USB flash drive and browse your game collection. The Armiga OS has been optimized for the ARM core, allowing graphics up to 720p and perfect sound capabilities without user intervention. It also allows to save games any point by using the savestate option, including those that don’t allow to save. Fully legal copies of Kickstart 1.3 and 3.1 are provided with every Armiga! To add more features and improvements just plug your Armiga to the Internet or place the update file into the micro SD card. The Armiga includes one virtual mouse and one virtual keyboard. So with only one pad connected to one USB port, you can handle everything within games. There is no need to connect a physical keyboard or mouse to it.